A homemade microfiber wipe folded in half - I use these to beef up other inserts when necessary. Unfolded these are 6" by 6". This is a blue microfiber shop towel from Fred Meyer that's been folded in half then half again and stitched around. It measures 11" by 3.5"
This is an orange microfiber shop towel from Fred Meyer (the same pack as the blue one) that was folded in thirds and stitched around. 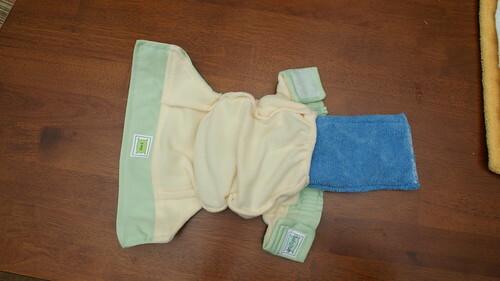 It measures 11.5" by 5"
This is the standard microfiber newborn insert provided with the BumGenius 3.0s. It measures 11" by 5". The shop towels from Fred Meyer are really soft and pretty thin but absorb quite well after they've been washed a few times. They come in a pack of 12 for $15. Costco also sells HUGE packs of shop towels in a crazy fluorescent yellow color. I believe there are 36 in their pack and I think it's also around $15. 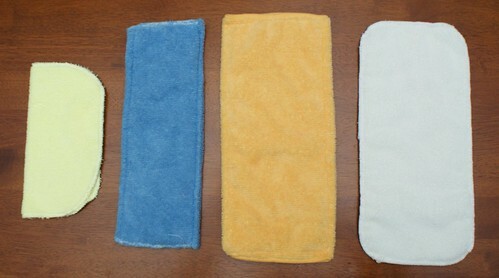 Inserts don't have to be stitched, you could easily just fold any of these shop towels down and shove them into a pocket diaper. If you do decide to cut them and sew them, I can give you a tip: You don't have to use a serger to finish the edges - you can actually lightly singe/burn the edges with a lighter to melt the fibers and keep them from coming apart. I started doing that after my serger continually rejected the thicker bunches of fabric (it isn't the best machine). 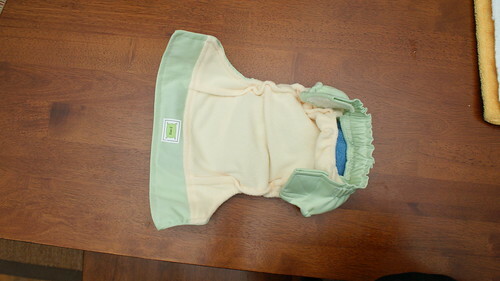 I hope this gives you some ideas on how you can make your own absorbent pocket diaper inserts.